"I'm not happy about it. It's not doing the trick, but I'm adding things to it. I will add whatever I have to add. It's all going to happen. We are going to build a beautiful, big, strong wall that's not going to let criminals and traffickers," Trump said in his first reaction to the deal since learning about the details of the agreement struck last night. He didn't say whether he'd sign or veto the deal if it were to pass Congress but did say he doesn’t think another shutdown will happen. If it does, he said. it “would be totally on the Democrats." “We certainly don't want to see a shutdown. But you will be hearing fairly soon. The bottom line is, on the wall, we are building a wall. And we are using methods other than this. In addition to this, we have a lot of things going,” Trump said. President Donald Trump speaks during a cabinet meeting at the White House, Feb. 12, 2019. On Capitol Hill Tuesday afternoon, Senate Majority Leader Mitch McConnell called the congressional deal a "good step in the right direction. I hope he'll decide to sign it." "I think he's got a pretty good deal here. I think he's done just fine," McConnell said. McConnell added that he supports the president taking executive action to “make up the difference” between the barrier money in the deal and the billions more he wants. "I think he ought to be free to use whatever tools he can legally use to enhance his efforts to secure the border. So, no, I would not be troubled by that,” McConnell told reporters when asked about the possibility the president might use his transfer authority to move money around. Senate Minority Leader Sen. Chuck Schumer called on the president to sign the bill as well, saying "I hope he doesn't make the same mistake he did a couple of months ago." 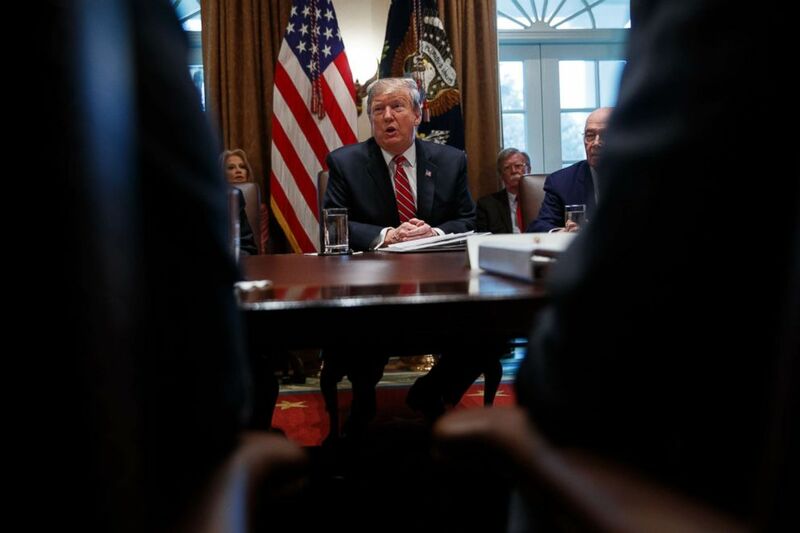 In reiterating his determination to build his desired border barrier one way or another, Trump said the possibility of declaring a national emergency remains an option under consideration. “I consider everything," he said when asked specifically about a national emergency declaration. "I'm considering everything. We also have national emergencies out there. President Obama, President Clinton, President Bush -- they declared many national emergencies. This is not unique. They declared many national emergencies. Many, many. You have some out there that we can use in addition to one that we can declare if we want to." The White House has also said there are options under consideration to draw from unspent funds within the government to build the wall without declaring an emergency. If the administration were to attempt to repurpose funds that were appropriated for other programs, the administration would almost certainly face legal challenges. 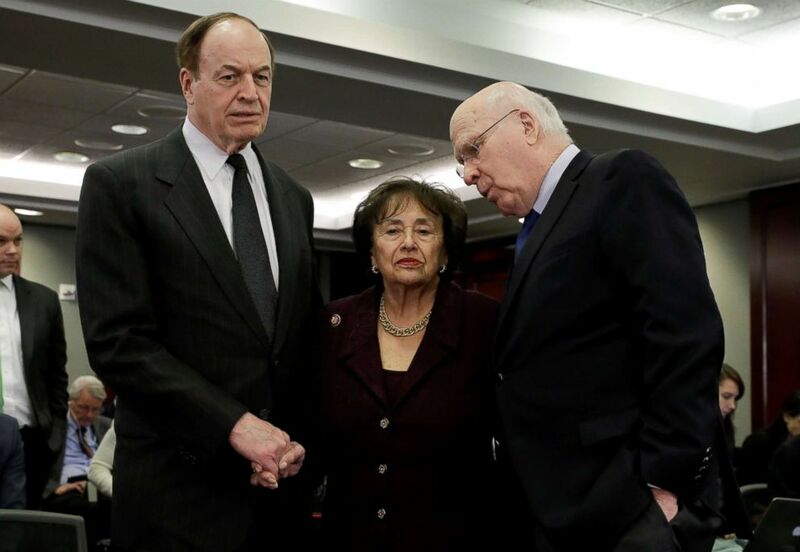 Senators Richard Shelby (R-AL) and Patrick Leahy (D-VT) talk with House Appropriations Committee Chair Rep. Nita Lowey (D-NY) on Capitol Hill, Jan. 30, 2019. The top four negotiators charged with hammering out a deal to avert another partial government shutdown emerged from a closed-door meeting last night to announce that they had “reached an agreement in principle” as the president was in El Paso, Texas, holding his first campaign rally of the year in a border city he has highlighted in his case for building a southern border wall. ABC News' John Parkinson and Mary Bruce contributed to this report.